Battle Beasts! When the second series was cancelled, I thought that was the end of it. Let's hear it for this mix-and-match line rescuing at least two of them! On his grassy planet, Ruminant enjoyed a peaceful life until it was torn apart by warring factions of Beasts. He has come to Earth in response to the Dread Summoning. As far as I can tell, Ruminant (originally just called "Shaka Giraffe," because until they have names, the characters are just identified by their species and the culture that inspired their look) didn't appear in the comic. In addition to the standard Minimate parts, he gets a new head and lower legs. His shoulder armor comes from Boom-Boom, while his gloves and loincloth originally belonged to Nukpana. 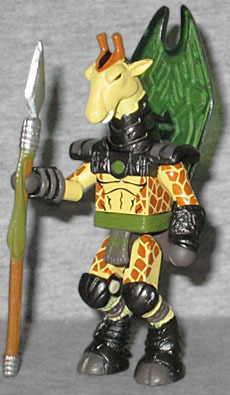 There was a giraffe in the vintage line, but this one doesn't seem to take any cues in either weaponry or colors. His grey armor contrasts with his yellow and orange skin. He's armed with a simple spear, and a large trans green shield that he can either hold in his hand or store in the clip on the back of his neck. 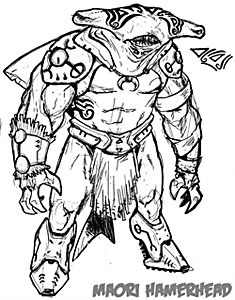 Spyrnus (née "Maori Hammerhead") definitely appeared in the comic - he's right there in the first issue! There was a vintage shark, but he was just a plain kind, not a hammerhead, and was also bright blue. His jagged hands are reused, but the rest of his armor is new. 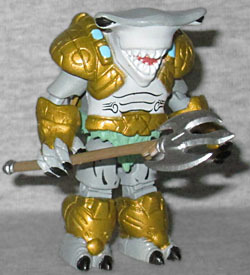 He has no neck joint, due to the way his head emerges from his torso, but the fin and tail are a separate piece glued into his back. The original design included facial tattoos, but those didn't make it to production. He's armed with a trident that can plug into either of the holes behind his shoulders. The back of the packaging for this line is marked CBHTRU1, suggesting they're available at Toys Я Us - but I've certainly never seen them there. I've been hyped for this line since it was announced, and I've been trying to find a comicshop that had it since it shipped. Eventually I had to resort to buying it online. (For what it's worth, it's hard to beat Luke's Toy Store when it comes to cost and reliability.) But I'm glad I got them, because these four pairs are all a lot of fun, and I really hope we get to see the line continue.